How to apply 3D lashes the right way? 3D eyelashes are considered to be the best eyelashes in the fashion industry now a day. They give the perfect volume to our eyes if applied properly. Before you start applying the 3D lashes on your lash line, you need to select a lash that is perfect for your eye type. It is very important as we all have different types of eyes and one eyelash cannot go with every eye. To decide whether the particular eyelash is good for your eye or not you will have to do a little bit of research. Try to find out which type of eyelash goes with which eye type. Now that you have the knowledge of your eye type and the type of eyelash appropriate for your eyes, you are set for the real process. The first thing you need to do is to take out your 3D lashes out of the boxes. If it is not marked on the packet that which lashes is for which eye then you can know this by keeping the packet at your nose. The way in which you get the right shape of the lashes is the right way to put it on your lash line. After you have taken the lashes out for application and have decided which one is good for which side, there is the time to measure it. 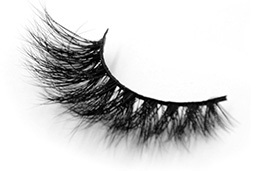 We wear the fake lashes to get a particular look and for that, the measurement of the lashes is very important. Once you have measured the lashes, it’s time to decide the size of it. If you need a look in which the lash size should be bit shorter, then in this step try to trim the lashes. This trimming of lashes should be done with utmost care as one wrong cut will destroy the whole lash. You need to cut it from the vein side. Before you move ahead to apply the mink lashes on the lash line you need to fix one thing and that is the pop-up. To fix this very common thing you need to rotate the lash from the opposite side around your finger or around any makeup brush. The most important step is to apply the glue for the lash correctly. Once you are done with the above steps you need to do this step properly. After you have applied the glue correctly, you need to ensure the place where you exactly will place the lashes and once this is fixed you can move ahead to do the final step. Keep the lash on the glue and try to fix it and it is done. To get that perfect eyes, application of eyelashes has become essential. If we talk about the 3D eyelashes, then they are the kind of eyelashes that give more volume to your eyes than any other lashes out there. The only thing that is required is the proper application of it.